Artist Roi Alter (1980, Jaffa) brings a short DaDa story by Kurt Schwitters into the contemporary art scene. In the theatrical, musical and sculptural performance Franz Müller’s Wire Spring set design become characters and the audience becomes more and more part of the performance. 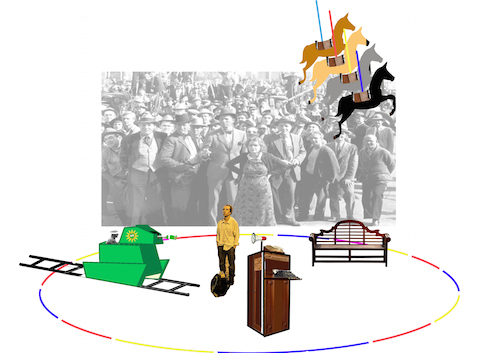 Story, sound, image, actors and audience mix into the same story, which is presented in a circus arena.